Carefully study the existing site. Know the site conditions -- light, temperature, soil, slope, drainage, air circulation -- and naturally occurring features like rock outcroppings. This is arguably the single most important factor in growing healthy plants. Most perennials grow best in soil that is well drained, with good fertility and a pH of 6.0 to 7.0. Organic matter is essential. It improves soil fertility, texture and water-holding capacity. Remember that standing on a planting bed compacts the soil and restricts root growth. Never step into a sopping wet bed and always be aware that concise movements will minimize compaction and breakage. Applying a mulch conserves water, reduces the need to weed and keeps soil temperatures cool. In addition, a decomposing organic mulch improves soil fertility, texture and water-holding capacity. Applying a winter mulch of evergreen boughs when the ground is frozen prevents plants from being pushed out of the ground by alternate freezing and thawing. Winter mulch keeps the ground uniformly frozen during the winter months and must be removed gradually, over a two-week period in the spring (ideally on a cloudy day). Winter mulch is used only on newly-planted or divided perennials and tender plants. Knowing the needs of each plant in the garden is essential because good growing requires a match of plant needs with site and soil conditions. It is important to know the size a plant reaches at maturity so it can be properly placed. A garden which is too densely planted will give an instant aesthetic effect, but is difficult to maintain. Most perennials benefit from lifting and dividing every three to four years. At that time, it is important to rejuvenate the soil by incorporating organic matter such as leaf mold or compost into the soil. Some perennials resent being disturbed and are better off being propagated by cuttings or seed. Newly-planted or transplanted perennials will need more water than established plants. Deep, infrequent watering promotes deeper roots and more drought-resistant plants. Deadheading or removing spent flowers can prolong bloom of some plants, prevent vigorous growers from self-seeding and is aesthetically more pleasing. Proper staking should support and enhance the natural growth habit of the plant without being visually obtrusive. Finally, the rewards from gardening are great. Gardeners should allow themselves the leisure to admire their hard work. Perennials--those nonwoody plants that come back year after year--offer almost endless variety in color, texture, shape, and size, making them suitable for virtually any garden location. Many are prized for their flowers; aster and phlox are just two of these. Others, such as ferns and hostas, are valued for their foliage. Unlike shrubs and trees, perennials do not have permanent woody parts. But while some die down completely at the end of each growing season, then reappear at the start of the next, others spend the winter as low tufts of foliage, ready to grow when weather warms. And a third type is truly evergreen, with foliage nearly unchanged throughout winter. All perennials have a minimum lifespan of more than 2 years -- but beyond this, longevity varies enormously. Some grace the garden for only a few years, while others survive much, much longer (peonies, for example, can live for generations). Though flowering perennials are often grown in borders, you'll also find them just about everywhere else. They may replace the front lawn or fill a parking strip; they may be used in the vegetable garden to add color and edge planting beds. Some gardeners set them among established shrubs to provide variety and add a touch of color to a predominantly green, leafy planting. Among the perennials that flower in summer and early fall, yarrow is among the most carefree and heavy blooming. Enjoy the blossoms outdoors in the garden or indoors as cut flowers; you can even dry them for use in winter bouquets. 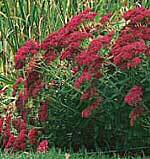 The large, flat-topped flower clusters rise on 1 1/2- to 3-foot stalks from clumps of lower-growing foliage. Colors range from white to pastel shades to paprika red, but the familiar yellow yarrows are still favorites. Plants grow well in ordinary soil and with only moderate water; in fact, they may languish if soil is too rich or too moist. Divide when clumps get too crowded. Prized for its late-summer bloom, this graceful plant bears loose sprays of slightly cupped, gold-centered white or pink flowers that resemble wild roses. Blossoms are single or double, 2 to 3 inches across, carried on 2- to 4-foot flower stems that rise from clumps of dark green, softly hairy foliage. Leaves are three to five lobed, up to 6 inches across. Foliage clumps are low in early spring, then increase in height as the season progresses. Japanese anemone is especially attractive planted in front of deep green shrubbery, where its flowers stand out dramatically against the dark backdrop. Japanese anemone prefers good, well-amended soil; it will take claylike soil as long as drainage is good. Plants tolerate some sun in cool-summer climates but need protection from afternoon sun where summers are hot. Where winters are severe, mulch plantings heavily in fall. A. absinthium 'Lambrook Silver'. WORMWOOD. Borne on erect stalks, the 2- to 5-inch, finely divided, silvery gray leaves have a strong, pleasant fragrance. Plants reach 1 1/2 feet tall. A. 'Powis Castle'. Covered with foliage so finely divided it looks fluffy, this one resembles a mounding, silvery fern and offers a nice contrast to many plants in both form and color. It soon reaches 4 feet high and wide, so give it plenty of room. In the coldest climates, take cuttings in the fall and replant new plants each spring. Asters are on many a gardener's list of favorite fall-blooming perennials. They're easy to grow and add color to the landscape when most other flowers are winding down for the year. This aster is a stout-stemmed plant 3 to 5 feet tall with hairy leaves to 5 inches long. Pink to deep purple flowers are 2 inches across; two favorite varieties are dark pink 'Alma Potschke' and deep lilac 'Treasure'. Stake plants early in the season to keep stems from flopping over. Compared to many other asters, New England aster is more tolerant of climatic extremes, taking high humidity and colder winter temperatures. It performs best in rich soil. It prefers regular water and will thrive even in wet soil; if it dries out too much between waterings, it's prone to mildew. Divide clumps every 1 to 3 years. Mainstays of the summer shade garden, astilbe provides both bright flower color and attractive foliage. Feathery, plumelike flower clusters in white and a wide range of pink and red shades emerge from loose clumps of toothed, dark green, almost fernlike leaves. Heights vary, but plants typically average 2 to 3 feet tall and wide. 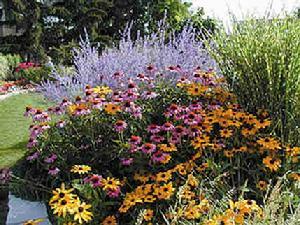 By planting varieties with staggered bloom times, you can enjoy flowers from late spring through summer's end. 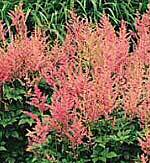 Astilbe needs rich, moist, well-drained soil. It does best in shade but tolerates sun if temperatures are fairly cool and sufficient water is provided. Survival in the coldest zones (1, 43, 45) depends on good snow cover. During the growing season, apply a complete fertilizer regularly (monthly to bimonthly, depending on soil). Divide clumps when flower production lessens, usually every 3 to 5 years. Botanists have changed this plant's name several times over the years; at one point it was removed from Chrysanthemum and reclassified as Leucanthemum (catalogs may still offer it as such). By any name, though, the yellow-centered white daisies look splendid both outdoors in the garden and indoors in bouquets. With routine care, plants will bloom happily from early summer through midfall. The 3- to 5-inch-wide, single or double flowers are borne individually on leafy stems rising from basal mounds of coarsely toothed, dark green foliage. They're long lasting--in some cultivars, an individual flower may persist up to several weeks. The most popular cultivars grow 2 to 3 feet high and 1 1/2 to 2 feet wide; some of the newer ones are especially heavy blooming. 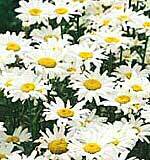 Shasta daisies prefer fairly rich, moist soil, though some do well in regular garden soil. In all soils, good drainage is important, especially in winter. During the growing season, fertilize regularly to increase the numbe of emerging flower stalks; cut spent stalks back to the ground after flowers fade. In cold-winter areas, mulch around clumps' bases in fall; don't cover remaining foliage, though. Divide every 2 to 3 years; replant new growth from the edge of each clump and throw away the woody center. Shasta daisy gall disease causes the root crown to split into many weak, poorly growing plants that quickly die. Dig out affected plants and do not replant new ones in the same spot. Threadleaf coreopsis blooms abundantly all summer long, carrying its daisylike, 1- to 2-inch, yellow flowers above clumps of ferny, feathery foliage. Blossoms are borne so thickly that you can't deadhead individually, so just cut back the multistemmed branches with shears; they'll soon regrow to bloom again. This plant isn't fussy about soil, but good drainage is important. It is somewhat drought tolerant. Divide clumps every 1 to 3 years--in fall in warm-winter climates, in spring where winters are harsh. C. v. 'Moonbeam' is a favorite; it forms a fluffy mound to 3 feet tall and wide, covered with pale yellow flowers. Striking flowers and a long summer bloom season make this carefree plant a favorite. A North American native, it forms 1 1/2-foot-wide clumps of hairy, rather coarse, deep green leaves that reach about 8 inches long. Borne on stiff, 1 1/2- to 3-foot stalks that never need staking, the 4-inch, daisylike flowers have rosy purple petals that droop slightly from a brownish orange, dome-shaped center; they're popular with butterflies. The bristly cones remain after the petals drop; some gardeners leave them in place to provide food for small birds. Purple coneflower needs no special treatment, though it appreciates some shade in the hottest regions. It does well in ordinary garden soil. It grows from a rhizomatous taproot and is better left undivided; because it grows slowly, individual plants can be left in place for a long period. To increase your supply of plants, take root cuttings in fall. The plant self-sows readily; remove seedlings if you don't want them or if they do not grow or bloom true to the parent. Among the countless ferns sold, you'll find excellent choices for every zone. The two below are widely grown. Athyrium filix-femina. LADY FERN. Zones 1-9, 14-24, 31-43. Deciduous. An excellent choice for wet, shady corners of the garden; it will also take some sun in cool-summer climates as long as it receives the ample water it prefers. Delicate, lacy, arching fronds rise to 2 to 3 feet; they're broader at the base, narrowing toward the tip. Divide every 3 to 5 years. Polystichum munitum. SWORD FERN. Zones 2-9, 14-24, 36-38. Evergreen. Extremely easy to grow. Leathery, shiny dark green fronds emerge from the clump's center and reach 2 to 4 feet long. Each plant eventually reaches 2 to 4 feet wide. Needs rich, well-amended soil. Prefers regular water but is not as thirsty as many other ferns once established, making it a good choice for shady but somewhat dry areas. This fern isn't a candidate for division, but the small new plants growing near the base of established clumps can be removed and planted elsewhere. Not to be confused with common garden geranium (Pelargonium), the cranesbills include spreading, mounding, and upright plants that make beautiful additions to the summer garden. Flowers are five petaled, often in shades of rose, blue, and purple; a few varieties have pure pink or white blooms. Beaklike fruits follow the flowers, hence the common name "cranesbill." Leaves are roundish or kidney shaped, shallowly or deeply lobed. One excellent choice is G. endressii (Zones 1-9, 14-24, 31-43), a 1- to 11/2 footer that blooms from late spring to fall (to early summer in hotter regions); its variety 'Wargrave Pink', with salmon pink blooms, is most widely grown. Also popular is G. sanguineum (Zones 1-9, 14-24, 30-43), a spreading, trailing plant to 11/2 feet high, 2 feet across,with deep purple blooms from late spring into summer. Cranesbills grow best in cool- and mild-summer regions, where they will tolerate full sun or light shade. Where summers are hot, provide afternoon shade. Give moist, well-drained soil. Clumps can be left in place for many years before blooming declines due to crowding; when this happens, divide in early spring. Lenten rose blooms late in winter, bearing nodding, 2-inch flowers in shades of whitish green, soft purple, or rose, often spotted with purple. The "petals" are actually sepals that shelter the tiny true flowers, which are nestled in the blossom center surrounded by a clump of yellow stamens. These petal-like sepals remain on the plant for several months, long after the true flowers have faded and seeds have set. Leaves are large (to 1 foot across) and dark green, divided into five to 11 tooth-edged leaflets; they're evergreen in mild-winter climates, though you may want to remove tattered foliage during fall cleanup. Both foliage and flower stems emerge from a central point; plants eventually form clumps about 2 feet tall and wide. 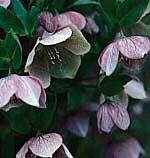 Grow Lenten rose in a spot that receives winter sun but is later shaded by deciduous trees or shrubs. It prefers rich, well-amended, neutral to alkaline soil. Don't fertilize more than once or twice a year. Lenten rose can be divided, but doing so is not recommended, since divided plants take several years to recuperate. However, plants self-sow readily--so to gain additional plants, simply let spent flowers go to seed. Hostas are favorites for the shade garden. Hundreds are available in nurseries and from specialty catalogs, from 6-inch dwarfs to 5-foot giants; the range of leaf shapes, textures, and colors is likewise tremendous. Foliage may be heart shaped, lance shaped, oval, or rounded; texture may be smooth or quilted; colors include all green shades, chartreuse, gold, and blue, and many have white, yellow, or cream variegation. Grow hostas in rich, well-drained soil; never let roots dry out during summer. These plants are carefree in their preferred zones but somewhat difficult to maintain elsewhere. Where slugs and snails are a problem, hostas are a favorite target and almost impossible to protect. In these areas, containers offer the best refuge. Ornamental grasses add a special touch to the garden. The fine, upright foliage of taller deciduous kinds ripples in the slightest breeze. Shorter kinds--both evergreen and deciduous--fill in nicely among other plants, either forming small clumps or spreading over a wider area. Hundreds of choices are available; the two below are manageable in size and easy to grow. Festuca glauca 'Elijah Blue'. Zones 1-24, 29-45. The best of the blue fescues, this annual grass forms mounding, fine-textured (but somewhat stiff-looking) clumps of a wonderful blue. Each clump is about a foot tall and wide. Pennisetum alopecuroides. FOUNTAIN GRASS. Zones 3-9, 14-24, 31-35, 37, 39. This is one of the smallest of the arching deciduous grasses, typically reaching 3 to 4 feet tall and wide. Bright green leaves emerge in spring. As summer approaches, pinkish flower plumes rise above the foliage mound; with the onset of fall, leaves turn yellow, then brown. Peony flowers are exquisite: large, showy, silky, single or double, available in colors ranging from white and pale cream through pink, red, and even pure yellow. Individual blossoms are as large as 6 to 8 inches across; many are fragrant. Bloom time comes from late spring to early summer; for the longest display, plant varieties with early, midseason, and late bloom. The plant itself is a shrubby, 2- to 4-foot clump of lush dark green foliage, with each 8- to 10-inch leaf divided into elliptical leaflets. In many areas, leaves turn golden yellow in autumn before the plants die back. The bush-form ("herbaceous") peonies just described are all cultivars of P. lactiflora; hundreds are available. Most need winter chill to bloom well. In milder climates, gardeners will usually have better luck with the Japanese cultivars, a popular group that blooms successfully in warm-winter areas. Peonies are extremely long lived: choose a permanent site where they won't have to compete with other plants, and you'll be rewarded with years of bloom. Give rich, well-drained, neutral to slightly acid soil. 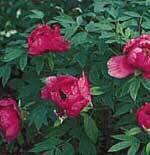 Plant the tubers in fall, setting them 2 inches deep in the coldest zones, 1 inch deep in warmer areas (don't plant too deeply; if you do, the peonies won't bloom). Mulch the planting area the first year after the ground has frozen. Plants may not bloom the first year. These bushy, typically upright plants are fairly short lived--but to make up for it, they produce lots of color over a long period. The tubular, 1- to 2-inch-long flowers, popular with hummingbirds, are carried on leafy, semirigid stalks that rise from clumps of narrow, 3-inch-long leaves. Flower colors of penstemon species are red, orange, and blue, but cultivars have increased the range to include white, soft pinks, salmon, peach, deep rose, lilac, and deep purple. Plants generally grow as wide as they are tall. Two widely sold species, both offering many cultivars, are P. barbatus (Zones 1-24, 31-43), reaching 2 feet tall and blooming from midsummer to fall; and P. gloxinioides (Zones 7-9, 14-24), a 2- to 4-foot-tall summer bloomer. Grow penstemon in average to sandy or slightly rocky soil; be sure drainage is good. These plants aren't divided, but simply replaced every 3 to 4 years. Don't fertilize them--doing so shortens their already brief lifespan. Border phlox is deservedly popular for the showy, dome-shaped clusters of fragrant flowers it produces throughout the summer. Plants reach 2 to 4 feet tall and almost as wide, making a dramatic addition to the border. Leaves are dark green, 3 to 6 inches long; individual flowers are just about an inch across and come in a wide variety of colors. Given the growing conditions it needs, phlox will reward you with healthy foliage and a long bloom season. Soil must be rich and well drained; dig planting beds deep and amend well with organic matter such as compost or well-rotted manure. Fertilize annually in spring. Deadhead spent blooms, since seedlings will not bloom true to the parent. Divide every 2 to 3 years, replanting only divisions from a clump's edges. Powdery mildew can cause serious problems in hot, humid areas. To combat it, plant mildew-resistant varieties such as 'Ice Cap'. Cut mildew-infected plants to the ground each fall; then discard the cut-off portions and any debris. 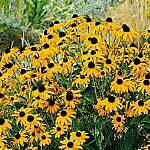 Bright colored and easy to grow, black-eyed Susan is covered with 3- to 4-inch-wide, dark-centered yellow daisies from midsummer until late fall. The flowers are borne on multibranched, 2- to 3-foot stems that rise from a 2-foot-wide foliage clump; leaves are medium green, elliptical in shape, up to 5 inches long. Cut for bouquets or deadhead during the season to prolong bloom, but leave the last blooms of summer in place; the dark centers that remain after petals drop can be used in dried arrangements or left on the plants as food for birds. Black-eyed Susan grows well in ordinary garden soil, spreading by underground rhizomes to form large clumps (you can remove newly emerging plants if they overreach their boundaries). Divide clumps when they lose vigor and their centers stop growing and blooming (every 4 to 5 years or so). 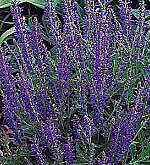 One of the most reliable of the hundreds of salvias grown for the garden, Salvia superba lends vivid purple-blue shades to the garden throughout summer and into fall. The 1/2-inch flowers are carried on 1 1/2- to 3-foot-tall spikes that rise from clumps of gray-green, 1- to 3-inch, elongated oval leaves with the distinctive sage fragrance common to many salvias. Among the many available cultivars, two outstanding choices are 'May Night', a compact plant (to 1 1/2 feet high and wide) with deep purple-blue flowers, and 'Blue Hill', also with deep purple-blue flowers but reaching nearly 2 1/2 feet tall and wide. This salvia grows well in ordinary soil but appreciates soil amended with organic matter. It tolerates some dryness but prefers regular water. 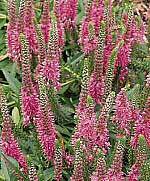 To prolong bloom, cut spent flower spikes to the ground. Divide every 4 to 5 years, when clumps become too large or die out in the center. This plant is a deservedly popular for the year-round interest it brings to the garden. It starts the growing season with fresh green foliage. Dense, dome-shaped, 6-inch-wide clusters of pale pink flowers appear in late summer; in autumn, they turn coppery pink, then rosy rust. The spent flower heads can be left in place for winter decoration and cut back when new growth emerges in spring. Upright or slightly spreading stems reach 1 1/2 feet tall and are evenly covered with 3-inch, roundish, slightly succulent leaves in pale blue green. Flowers appear at the stem tips. This plant grows best with full sun and fairly dry soil, but it will also take partial shade and some additional water. Clumps gradually increase in size to 2 feet across; divide them every 2 to 3 years, or center stalks will begin to dry up and fall off when flower clusters emerge. The soft, thick, woolly white-green foliage of lamb's ears is a favorite of many, especially children: it's difficult to pass a planting without stopping to pick a leaf to feel its softness. These 4-inch leaves grow in dense, ground-hugging rosettes; clumps increase by sending out aboveground runners. A mature planting reaches about 1 foot tall and as wide as you let it spread. Lamb's ears is usually grown at the front of a border or along a pathway, where it's easy to see. Veronica species--commonly known as speedwells--offered in nurseries and catalogs. In summer, its rounded clumps of small (to 1 1/2-inch), green, oblong leaves send up candlelike blossom spikes 15 to 20 inches tall, densely packed with tiny (1/4- to 1/2-inch) flowers. Blossoms are tubular, flaring out to four or five lobes. Cultivars include blue-flowered 'Blue Fox', 'Red Fox' (deep rosy red blooms), and 'Icicle' (white blossoms, gray-green leaves).